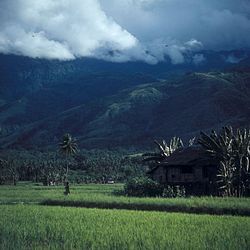 'S e Sulawesi (neo na Celebes) eilean a th' anns an Innd-Innse. Tha e suidhichte anns a' Chuan Sèimh. Tha Sulawesi cho mòr ri 174,600 cilemeatair ceàrnagach agus mar sin 's e Sulawesi an 11mh eilean as motha air feadh an t-Saoghail. Anns a' bhliadhna 2010 bha timcheall air 18,455,058 duine a’ fuireach air an eilean fhèin, tha Makassar am baile as motha a tha ann. Air a tharraing à "https://gd.wikipedia.org/w/index.php?title=Sulawesi&oldid=480390"
Chaidh an duilleag seo a dheasachadh 3 dhen t-Samhain 2014 aig 17:40 turas mu dheireadh.